These bathroom cleaner sets look AWESOME. I hate mine. I so need to go green! Thanks for sharing. I'm so excited Method has toilet cleaners! I use their tub and tile spray, it's yummy! Now I can get rid of my yucky toilet cleaner stuff. I love Method's O Mop. I've really enjoyed their Nearly Naked line...no scent, but the same Method clean. Excited to try something like this...my kids have severe allergies and maybe thinking this is part of the problem (cleaners)?! I love when you have Method giveaways. I truly haven't found a Method product I don't like, but I especially like their microfiber cloths. I would love to try them all. I am due at the end of Sept. and it would be nice to be able to clean something with out wondering what damage it would do to my baby. As it is I leave the house when my husband cleans. We no longer use any chemical cleaners in our house, aside from bleach every once in a (very) blue moon to save expensive clothing. As for the method products, I think they're fab! I am dying to try the peppermint vanilla surface cleaner. Our family is trying to become more "green" this year. I am in the process of changing out my toxic cleaners to more safe ones, but have never tried the Method brand....I have heard some great stuff about them though! I would love to give their bathroom cleaners a try! I ONLY clean with non-toxic cleaning products. I saw a 3 pack of the Bloq body washes at Costco and had to try them out. They are fab and leave my skin feeling rejuvenated! Can't wait to read your full review. I love the sounds of these. We currently use some 'scrubbing bubbles' and the smell lingers on and on. i hate it! the smell actually makes me sick. ick! need to change to something else! Method is my absolute favorite of all- their style, ingredients, and scents! And I only use non-toxic cleaners in my house!! Non-toxic is the way to go, especially since we are on a well and septic system living in the country. This set actually looks nice enough for a display!!! With a new grandchild - I am much more aware of the cleaners I use around my home. I would love to get rid of those harsh bathroom cleaner! Thanks for another great giveaway - I don't know how you do it! my hubby is allergic to alot of the cleaners so i have a hard time finding time to clean the bathroom. also by i don't want my baby boy breathing in all the toxic fumes in most cleaners. i've never used method but heard that it's good. where do they sell it. i'm not sure that i've ever seen it a walmart but i may not be looking in the right places. cool give away. Method products are great and it's good to see this new line - I love the space for the sponge (even though I don't use sponges!!). I like method scents and packaging, grapefruit and cucumber have been my favorites. Their stainless steel cleaner is also really nice. Awesome. My husband I have been talking about this very thing! Totally love it! I'm in process of converting to green cleaners so would love to try this brand! I love all of method's products, it's hard to choose! And I'm loving that bathroom products are the next line! Method products always smell so good. I can't wait until green is the norm. Love, love, love Method. My current favorites are the shower cleaner and anything from the Go Naked! line. Love Method products and their innovate design! I love this even more! I love Method products and am always looking for them at stores. This stuff looks really great and Method makes a great product! I use baking soda and vinegar to clean when I can, but, I'm still using up a big stash of chemical cleaners, too. I've been planning to try the Method cleaners when my current stuff runs out. I'm happy to see that they're adding bathroom cleaners, too! whew! I love method and was disappointed last week when their website wasn't working and when I saw some of their products discounted at Target, I was afraid they were going belly up, but it looks like they were just redesigning. yay! I've tried some Method products and they seem great! White vinegar is a great green cleaner. I love boiling it in the tea kettle to remove sediment. We're pretty diligent about using as much green cleaners in our house as we can. They can be pretty hard to find in our neighborhood, though. I'd love to try the Method brand, particularly the toilet bowl cleaner. So need the bathroom method cleaners! But I wouldn't mind the detox kit as well...wanting to go greener and greener every day! I've used a lot of method products over the years - their eco-friendly laundry detergent is great. I would be very interested in trying the new toilet bowl cleaner. I have one of the Method cleaners that I bought when I was pregnant and love the scent. These new ones look great. I love the wipes - pink grapefruit! Great idea. I love all method products, especially the grapfruit all purpose cleaner! I love the Method products that come out at Christmas time that smell like cinnamon. I am really fond of Method cleansers and appreciate how they are expanding their line! It's wonderful to find products that are safe for my family and economical. Other safe products are either difficult to find or outrageously expensive--but when we were pregnant with first dd, dh & I made the switch. Now, Method combines what we want in cleaning products with what we'd like to spend--awesome! Our favorite Method item for a few years now is the Almond Scent Wood for Good. The scent is heavenly, the wood looks lovely and it feels clean! Take care and thanks for your blog. I love all of the method lavender things - I first got it for the color, but love everything about it! modmom mom is hell of fine! How can you NOT love Method. Great design, good cleaning and an eye on the environment. I love love love Method! My current fave is the tub and tile cleaner, smells so fresh and good, and even cleaned burnt up goo off of my stove top. I clean all my floors with hot water and vinegar, so that's my most commonly used enviro-friendly cleaning "product." But I've never used method before! Perhaps this is my chance. Hi! Here we don´t have anything like this, I´ll love to try! wow I love method...and Meleluca is getting so expensive better shipping and prices!!! I love all method products, especially the micro fiber cloths. I love my method cleaners. For one, I can feel ok letting the help me clean. They aren't breathing in gross toxins. Second, they smell delicious! Third, a few of their products I can't live without, one is the Ylang, Ylang shower spray...After about two weeks, I'll never think about scrubbing again! First-time commenter, but just heard about these Method bathroom cleaners at another site. It was my NY's resolution to go more green in 2008 in small and bigger ways, so this would fit right in our family's plan! I've been using Method products for a while now, mostly the all purpose sprays (the lavender is my favorite), and I love that you can get them at Target. With a new baby on the way, using non-toxic products is even more important to me. I love the Method hand soap. I really haven't tried anything else yet, but I'm always looking for better cleaning products! yay! i love that method is nontoxic and my husband loves that its packaging is so "sleek". i can't wait for these new products! I am currently working to use up all of the remnants of cleaners in our home so that I can switch over to more natural products, vinegar, baking soda, etc. I currently have not tried any Method cleaners, but I have seen where some of their cleaners, such as the dish soap, have been selected as "the best," so I am eager to give them a try. I too would love the chance to try this out as I really am trying to go greener. I love the idea of non toxic cleaners. There air care products look great. I've just begun the "green" journey and need help. Thanks for your giveaway. These would be great to have with kids and pets, knowing they're safe! This is a great product. Please enter me to win this as well. Also, I love the bloq body lotion. My eldest has issues with lotions, and anything that would be easier on her skin would make me so happy ! I like safe cleaning products, safe for humans safe! I love cleaning products that are safe for not only the kids to be around, but us adults as well. Method makes the best hand soap. I have one by every sink in our house at all time. I've never tried this cleaner, but would love to since everything else I've tried by Method I've loved. Thanks for the great giveaway! My cleaning stuff needs to be non-toxic because my daughter touches everything. In true toddler fashion her hands and fingers find their way to her sweet little mouth and that means what I clean with is bound to get in there as well. It is not a choice when you have kids, it is a reality and one that I will continue with long after her childhood is gone because the cleaning chemicals don't trash my skin like the old stuff I used to use did. I really like using the All Purpose Cleaner because the French Lavendar helps me get in the mood to clean. It is so fresh and lovely that I don't mind the dirty work. And despite the fact that I have serious "DISHUES" I will even do the dishes as long as I have the Pink Grapefruit dish soap. One of my goals for 2008 was to go green, and so far I'm on the right track. I've been a fan of Method products for a while now. I love scents that they offer and knowing that they are safe to use around my children and pets. I think the Vanilla Peppermint seasonal flavor is by far my favorite! Love their grapefruit dish detergent. It almost makes me enjoy doing dishes. the coolest thing are the guys that founded the company as a university design project. a scientist and a marketer. i looked them up a long time ago, as i was always a little suspicious; they never listed any ingredients. alas, their philosophy lined me out. the shower scum! spray! I love Method. my wee one has crazy sensitive skin so i recently ordered the Method baby laundry detergent and am loving it. I love all their cleaning products. But the one we use everyday through out our home is their "Sweet Water" hand soap. I love all of their products, especially anything lavender. I want to use more environmentally cleaners, and excited to see more of them on the market. I use the method dishsoap and love it. 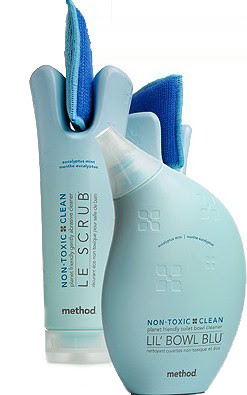 oh i am addicted to method and can't wait to try their toilet scrub! i love their grapefruit multipurpose spray and their stainless steel disposable cleaning wipes...i assume this product will rock just as much. Since the birth of our first child, I have been cleaning the majority of our home with vinegar, baking soda, and water. After four years, I frankly am tired of smelling like a pickle. Thank goodness there are now so many safe alternatives on the market. I love Method's Cucumber scented hand soap (not really a cleaning product) probably because it knocks the vinegar smell of of my hands so well! We also use the daily shower spray to keep icky stuff at bay. Cleaning green is SO important to me! After miscarrying my first pregnancy I've been making major changes in my life - I only use green cleaners in my house now. I know it was all part of God's plan, but the loss has made me so aware of what is getting into my body. My favorite from Method is their "sweet water" hand wash - it smells soo good :) Thanks! With 3 little boys, my bathrooms are a mess!! This would be great to win!! Method products look awesome...pink grapefruit detergent especially! I am really glad to see a trend towards readily available green products of any kind. I use the 'Go Naked' Method dish soap and I am very happy. It does a great job cleaning(I hand wash all of my baby bottles and toys) and it is gentle on my hands. Regular dish soap will make my hands peel and crack, yuck! ok-so have you tried the method body cleansers!! they rock! This is my first time checking out your blog. Love it! My kids love to help me out when I am cleaning. They are 3 and 1, so I have to take advantage of their eagerness while they are willing! I feel good letting them help with Method products which we almost exclusively use. I would never let them help out using non-green products. I don't even like to breathe those in myself, much less have skin contact with them, so I certainly wouldn't let my kiddos. I just saw the new toilet cleaner, but have yet to purchase it. I would love to give it a try. I have never used non-toxic cleaners, but I would love to start. Tey sound pretty cool! love, love, love the packaging of method products. but more so, love that they are far better for the environment than traditional cleaners. i use their lavender counter spray all the time. and it smells so good! I have actually been reading a LOT lately about non toxic cleaners and have been trying to win some for a while now. Maybe I should just get out there and buy them! I want to make my home safer for my kids. Not build them up with bodies full of nasty chemicals. They get that enough, just going through life in this world. I really love non-toxic cleaners and am in the process of removing all unecessary chemicals from our house. The design of this particular product looks great! I just love that non-toxic cleaning products are becoming more mainstream and readily available now. It's good for all of us! I can't wait to try their Go Naked Wipes. I feel more confident using Method cleaners around my children! I like anything that is natural. I love their detox stuff to get the residue from the old cleaning products off of the surfaces of our home. They say the home is the most toxic place to be-this definitely changes things. My goal for this week was to find a toilet cleaner that's not going to kill us in the process of cleaning! Yay for Method. I love their soaps and wipes. I also love the OMop although I should use it more! I lvoe their all purpose french lavender spray! Love the bathroom cleaning set! Thanks for sharing! Now that we have a little one, I am trying even harder to use all non-toxic products. I love to use Method to wash our clothes and clean the bathrooms. I have tried the floor cleaner and liked that. We also have the hand wash, which is great as well. Would love to try the bathroom cleaners. Thanks. The bathroom is the hardest/worst place to clean and I hate the smell of the harsh chemicals so I would love some green options that replace the chemicals I use now! These look great! I love the smell of method products...I currently love the mint window/glass cleaner and hope to incorporate more products soon! Oh finally toilets can go green! :) I love method's leather wipes, actually. I use them on my wood furniture and they work awesomely. I love my Method all purpose cleaner because I don't have to wear gloves while I clean! I would love to try the bathroom cleansers. I love how the Method cleaners I use smell -- the Almond wood cleaner, especially. I like that I can use them without worrying about my kids and dog since they all play on the floor immediately after I clean! I love non-toxic cleaning products, it makes me feel good that our family can touch and eat off the counters without getting chemicals all over themselves. I love love love the Method shower cleaner. I love Method products, and have been trying to cut out harsh cleaners ever since I had my first baby three months ago. Would love to try the bathroom cleaner set!!! Now that I know they make a free & clear HE laundry detergent, I'm going to have to try it! I've been looking and looking for good safe bathroom cleaners... hurray, now there's another one to try!!! I hadn't heard of Method cleaners until now. They look like they would be great for us. My kids have very sensitive skin, so I have always had to be very careful in the laundry and cleaning products I choose. i like green so the smell of toxic does't hurt me. Hot water and vinegar is what i use. This is a bandwagon I just recently hopped on so I'm just learning still. I'm hoping for it to be safer, healthier and less damaging. I never tried any non toxic cleaners, I would like to use them, maybe I'll win and I can see how good they work. I have been using Method products for years. My favorite scent is lilac. I would like to try them all so that I can get away from all of the harsh chemicals on the market. there's no good reason not to be responsible in life. non-toxic cleaners help make this easier. thanks. i really like the method tub and tile cleaner. Yes! I will try this!!!! I prefer the non-toxic cleaners because they cause less strain on our local water treatment plant. Method's microfiber cloths are great. I love the Method bathroom cleaners - they don't smell like a chemical plant. The area I live in is becoming over-developed, so the less I contribute to destroying our limited environment, the better. I have never used non-toxic products, but I think it's a great idea and would love to try them. Love the Method products-so much better for the environment.The Method olive leaf handwash smells great! I wanna win! it would make my husband happy! Everytime I clean with any kind of regular chemical cleaner, he says " What stinks?"! And he hates the smell of vinegar so maybe these products will please him! I love non-toxic products. My son has really bad allergies. I have to be so careful what I clean and wash with. I love your shower cleaner!! I'm making the change now. Hope it helps with my allergies. the o mop is one of my favorites- it leaves the floors crawlable for little ones-no chemicals to get in their mouths. i also love the 'holiday' kitchen cleaners this year the peppermint was awesome! I really need to switch to safer products. I always feel sneezy and yucky after cleaning the bathroom. Maybe this would be a good solution for my family. I am trying to use more and more non-toxic and organic cleaning supplies. It is better for my family and the environment. I haven't tried any Method products, but I would like to. I have environmental allergies and am have reactions when I touch chemicals etc. I've been using baking soda and vinegar to clean our place lately; but I would really appreciate winning and trying the Method products. I've practically switched all my cleaning products over to Method. I trust the brand to clean my home and keep my family safe from harmful toxins. I've never used Method. I normally clean my home with vinegar and water. But, I can certainly use this!!! I'm a cleanaholic and any cleaner that doesn't mess up the environment or act up my asthma gets a thumbs-up from me! I'd like to try this- I feel compelled to switch over to more earth-friendly products, but have no idea where to begin! i would love to try these bc. i think "going green" is so important! my current method favorite is their handsoap, i buy it at target! I really like non-toxic cleaning products especially since I have a cat that gets into things occasionally. Plus, non-toxic cleaning products are safer for the environment and I like to do what I can to help out the environment. I would really like to win this prize. I could clean all night. I have never tried Method non-toxic cleaning products, but I would love to give them a try. I am slowly becoming green with our cleaning products...just have to find things that do a great job. I was never chemical conscious until my daughter was born. Method's Detox Kit looks like just what I need to kick off my switch to "green". ...these new Method products can fit right in with my new cleaning philosophy: no eye watering, lung choking fumes just to get my bathroom clean. Presently I use the Method dish soap. I love non-toxic cleaning products. They are so much better for us and the environment. I love the Method all purpose spray in french lavender. It keeps everything clean and smells wonderful. Method is a great product for those of us with allergies, including me and my pets. The Lavender all purpose spray is my favorites so far. I think it's vital to detox your home by cleaning out all those harsh household cleansers that are lurking in a cabinet or shelf somewhere. I've been slowly updating my cleansers as I run out. I feel more at peace knowing I'm doing a small part in helping our environment... and it encourages me to tackle larger recycling problems in our house. Start small and keep going! I haven't tried these yet as I have to use up what I already have. Non toxic products are a great idea--winning some would be even better. Thank you for the contest! Healthy products with great packaging design! I have been trying to go all non-toxic cleaners in our house, Method products are the greatest, I really like their shower spray, thanks for the giveaway! I've been a big fan of Method ever since it debuted at Target. I really like the laundry detergent and moist dryer sheets. Thanks! love non-tox, i'm always concerned what my kids are ebign exposed to. I've never tried any of these but I would love to. I guess I have to get with it! Non toxic is the way to go. I'm learning more and more about nontoxic products and like them because of how they are so much better for our little ones sense their immune systems aren't quite capable of getting rid of toxins like adults can. Our waterways are so polluted with chemicals down here in Pensacola, FL, I am wanting to do whatever I can to help keep the toxicity down. I also believe that this will also be better for my dog and cats (who LOVE to drink out of the potty)!! i love method and I love how good it is for the environment. I'm a child of the 70s and I'm still out there volunteering to clean our local river. I always try to buy non-toxic household cleaners; I'm excited that Method is making bathroom cleaners now. I love method, especially the shower cleaner. Can not wait for the bathroom products - I love how I don't have to worry about them around the baby. I use all of the Method products and they are great. They do a good job cleaning AND they're good for the environment. Plus, the smells are... unique. The blue bathroom cleaner smells disconcertingly like the brand of mouthwash I use, and the wood cleaner smells just like grandma's almond cookies. I love the method products. At first I was skeptical on whether or not they would work. They are fabulous! These are fantastic products - I can clear my conscience and have a clean house. Sounds like a much healthier alternative to traditional cleansers. I love the OMOP! I use the all floor one on my ceramic floors and feel great that it is also good for the environment! with kids around non-toxic cleaners is a must.i would like to try the shower cleaner. I love Method's Cucumber scented cleaner and it does not leave me ill when I'm using it like other harsh chemical cleansers do. I wish all my cleaners were non-toxic cleaning products. LOVE, LOVE, LOVE, the tub and tile spray. WE have hard water and it does the trick! I have never used these products. Would love to use something much saver in my home. I'm going to start buying this! I would love to win it! It's safer around my children. I hate to admit it, but I haven't tried these products yet. Thanks. I feel confident using Method products around my child and cats. I have tried quite a few Method products- laundry detergent, all purpose cleaner, granite counter top wipes, hand soap, moist dryer sheets, and surface wipes to name a few. I have yet to try the bathroom items...but would love to try them!! BTW- great blog! Thanks!! and I meant...would LOVE to win them!!! :) THX. We love the Method products. The go naked products are great for us, since we're allergic to perfumes. Thanks! OOh, would love to try this. ANd the packaging is so pretty! Simple Green is great . Makes me feel better than cleaning with chemicals after which I get house maid hangover! And good for the environment too. I have used Method products before. I feel non-toxic is cleaner. What good is clean if it leaves cancer causing residue? I love this product. My husband is taking chemo for cancer in his lungs so anytime I can clean, kill germs and still not have that toxic smell in the house I go for it. Thanks for a great enviro safe giveaway. I would love to try this product. As the mom of four young boys I spend a lot of time cleaning bathrooms. I have always used chemical cleaners and would love something safe, effective and green! i can let my kids help me clean! In the past I've used Method's dishwashing liquid in Mandarin and sometimes Cucumber Melon scent. Not only do I love the scents, but the bottle designed by Karim Rashid looks really cool and stylish next to my sink. Method's products are so fabulous and great-smelling that it's a bonus that they're environmentally friendly. I think it is great! It is great that there are more alternatives for the toxic cleaners that is available to most of us. Some don't realize that the cleaners we've adapted to over the years is more toxic than we think it is.